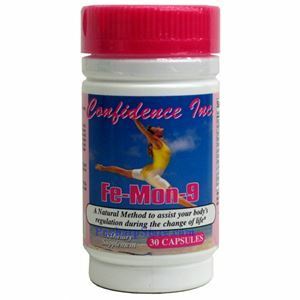 Fe-Mon-9 is the fastest way to help woman's body to naturally support her own female hormones. Maintaining a normal hormone level for both developing and maturing women is essential. The decline of estrogen levels is considered the primary cause for the emergence of aging symptoms in women. After many years of research and development, Fe-Mon-9 was formulated as the natural answer to age-related side-effects in women. Fe-Mon-9 provides the necessary nutrients and compounds to help a woman's body support the normal release of its own hormones through the function of the pituitary gland and ovaries to allow natural hormone synthesis and regulation. Direction: Take one capsules daily. Within seven days of taking Fe-mon-9 you will notice a decline in mild symptoms and within thirty days experience remarkable anti-aging benefits. However, the active ingredients in Fe-mon-9 require a certain amount of accumulation in the body in order for you to achieve the best results. We recommend that you take Fe-mon-9 for at least three months to ensure the best results.